Whenever my best friend comes in town to visit, we always schedule our weekend with a ton of fun things to do. 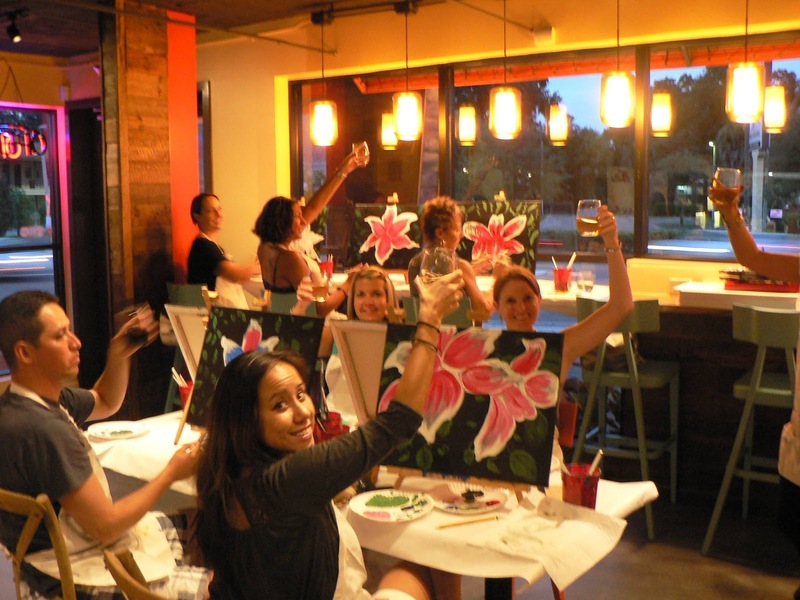 A few months ago, I came across a living social for Party Artsy, a hands-on art class which takes place at various popular local restaurants in Tampa. These classes are taught by an expert artist and come with a complimentary glass of wine. I will be honest and start this off by stating, when we purchased our Living Social for Party Artsy, we both went in with zero expectations. Keri feared it would be fuddy duddy and I encouraged myself with the fact it came w/ a glass of wine. 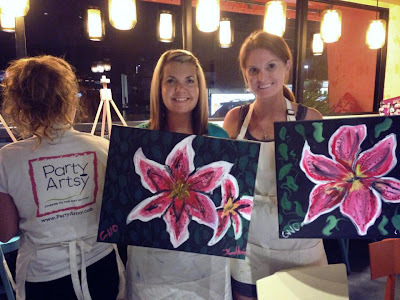 What we were not expecting was our night at Party Artsy being the highlight of our extended girls weekend. We walked into the Flying Pan, the pop up location for our class. 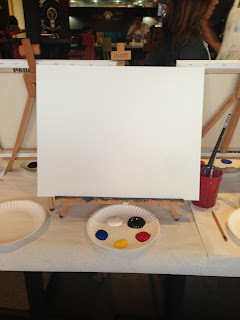 We were greeted with blank canvases and all of the supplies we would need to paint a hibiscus flower along with a glass of wine. We were able to purchase crepes at a discounted cost and we promptly ordered the Nutella crepe. We were instructed that this was a fun experience and if anyone got that look of frustration on their faces, a party artsy cheer was to take a place. 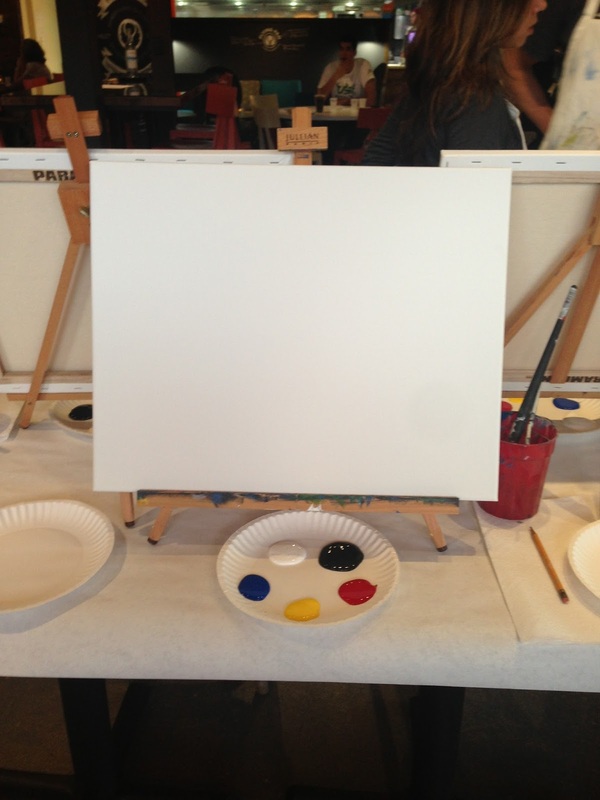 They say Party, we say Artsy and then take a sip of our wine. We were guided step by step, shown how to mix primary colors to create the perfect pinks and greens. If we messed something up, we could cover it with black and start over. I loved seeing how all of the others final painting ended up. I chose to remove my second flower as we were going along. This will be something we will do everytime Keri comes into town for a visit. It was a ton of fun, not at all stressful and you got to take home something you created yourself. Keri and I will both be placing our flower paintings in our offices to remind each other of our fantastic time! You can check out Party Artsy's calendar of events on their website and on their Facebook page. They also do private events! This is something I would encourage anyone in Tampa to check out. 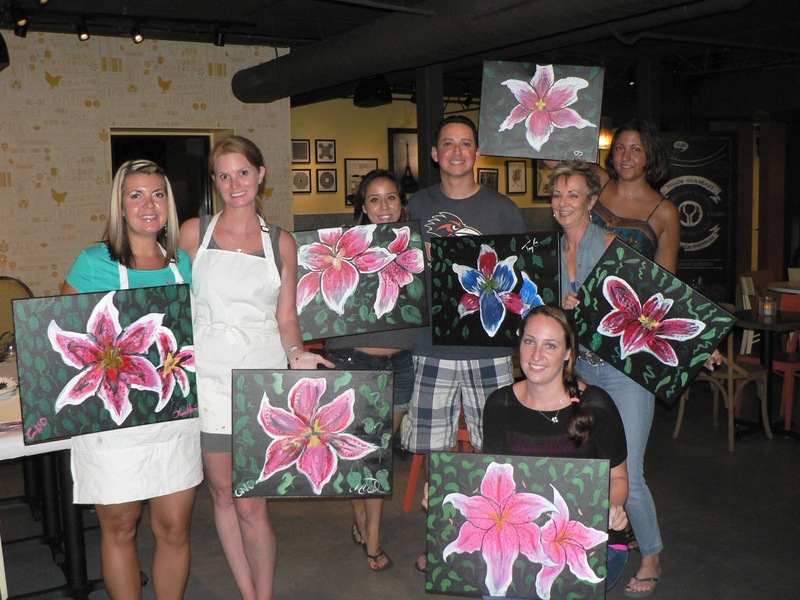 I know we talked about this, but I love the painting and boozing get togethers that are more common now. I usually go to Sketch & Sip in Riverview because I have a relationship with the owner now (I'm a frequent visitor), but when I was at Flight the other night, Party Artsy was there! I have seen pics of others doing this... looks so fun but I don't know of anywhere near me that does this! I will have to look out for it.